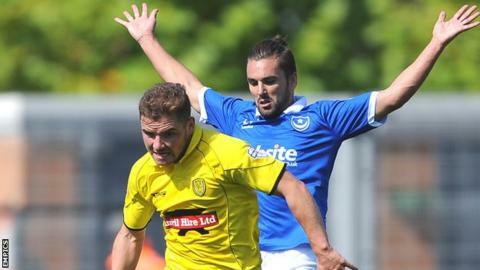 Burton Albion midfielder Alex MacDonald has said Sunday's 2-0 win over Portsmouth should put the rest of League Two on alert. Victory against a side considered among the favourites for promotion moved Albion to the top of the table. The Brewers are unbeaten in eight games in all competitions so far this season. "It was a statement to the rest of the division. They will realise and see what a good team me are." 25-year-old MacDonald told BBC Radio Derby. "It's not to say they didn't anyway because last year we had a very good team and we came short at the last hurdle." Albion, last season's League Two play-off final runners-up, have won five of their six league matches so far and advanced to the third round of the Capital One Cup with victory over Premier League side Queens Park Rangers. Lucas Akins, who scored Albion's second against Portsmouth, said the Brewers need to remain grounded despite the club making their best start to a season in almost 55 years to occupy their highest ever league position. "It's great to be unbeaten at this stage, but nothing is won," said Akins. "It is a great start, but we have to be consistent and carry on picking up points."